On June 4, President of Mozambique, Armando Emilio Guebuza visited the Biofuels Center of Bilibiza in Cabo Delgado, promoted by ADPP, Humana local partner in this country. Guebuza was very interested farmer groups or the Farmers Club, jatropha cultivation and biodiesel production plant from the seeds of this plant. Bachir Afonso, a leader of the project was commissioned to provide complete information to the President about the project, an act which was also attended by members of the Farmers Club, which showed some examples of products in currently being cultivated. With this project, ADPP has been at the forefront of the production of jatropha as a tool to encourage the development of the poorest communities in the area. Jatropha oil, besides being used as motor fuel, also used for the manufacture of soap and bio-pesticides. 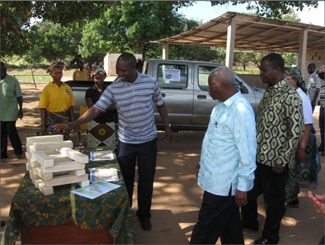 Until now, the seeds produced in Cabo Delgado have produced more oil than those used in other similar projects. This fact proves that the Mozambican province has the climate and soil suitable for cultivation of jatropha. Thus, the percentage of oil extracted varies between 20% and 25% by weight of the seed. The bi-fuel plant serves the farmers participating in a project Humana Farmers Club, which aims to provide knowledge and proper organization participating farmers as they respond to the needs of their families and their communities, increase their incomes and join the market economy. The farmers are organized into groups of 250 members with a project manager who provides the theoretical and practical agricultural training necessary.